November is the shortest month. or that's what it feels like anyway. here we are a week before the official start of the holiday season, aka The Month of Lists. 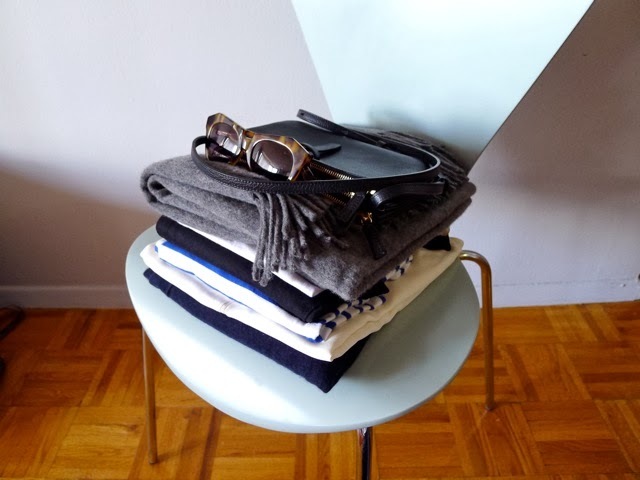 the relative calm before the start of the holidaze is a good time to reflect on the past year...so here are the purchases that have become tried-and-true mainstays in my wardrobe. 1. everlane basics - hardly a day goes by when i'm not wearing a cotton tee, silk blouse, or cashmere knit from their line (reviewed here and here). 2. annabel ingall trio bag - my most useful and most-used bag of the year (reviewed here). lately i've been carrying it tucked inside my work tote as an easy organizer/clutch. 3. karen walker tort sunglasses - so well made. so glad i finally splurged on these. 4. acne oversized wool scarf - cozy, cozy, cozy...and not a bit itchy! (reviewed here). 5. rag & bone black skinny jeans - the clean simple jeans. alternating between these and my A.P.C.s every day. so grateful for the friendships i've made with the many inspiring, cool women i've met through this blog. and to everyone who takes the time to read and/or comment, thank you! 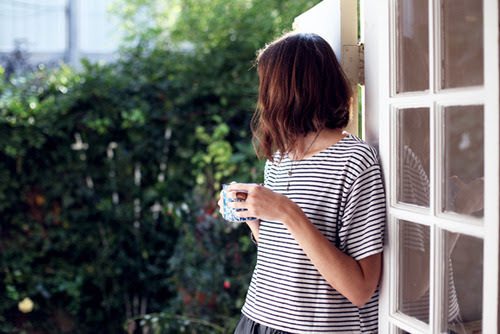 when in doubt, wear a striped shirt. a great pair of sunglasses is my talisman. items permanently filed under 'great in theory but just don't work for me': shirt-dresses, wide-leg jeans, lambskin Chanel bags. the morning routine doesn't lie – the real 'investment purchases' are the things that you use everyday. what about you? what are your best buys of the year? A little cotton field/military jacket from UNIQLO. A pair of Steve Madden brogues. And a killer Dries van Noten shift. Wardrobe stars from all parts of the cost spectrum:). I love your style, you know that, right? that's so kind of you LPC - thank you for being such a longtime supporter and commenter! Isn't it great when recently acquired items become mainstays? My favourite items at the moment include a selection of leather bags - a black duffle by Alexander Wang, a Clare Vivier Messenger in navy and a bespoke asphalt duffle from India. I am also loving my newest pair of Levi's skinny jeans - blue, about four months old - and two grey cashmere pullovers (one round-neck, one v-neck) and two blue/cream ikat cashmere scarves hand-made in Nepal, purchased this month. All worn with an old, perfect pair of black satin sneakers by Lanvin and my delicate old gold and diamond jewelry. Skirted leggings from Eileen Fisher. I never thought I'd really like them, but their sales staff talked me into them, and now I wear them every week - so much so that I bought a 2nd pair! if you want to buy something, consult miss sophie cuz she probably owns the same thing lol. When in doubt, wear a button down and slim trousers and a low profile shoe with backpack. These 'staples' basically became my wardrobe at my more uniform-rigid workplace and I was able to mix/match/vary the pieces with just about everything. I've got a couple others, but they're mostly jewelry and basics. My closet is rapidly turning into a collection of staples. I'm enjoying it. A iphonebag from mulberry (bougth it really in the end of december 12), a long cozy cardigan from Acne, a parka from Fillipa K, a scarf from By Malene Birger and a pair of Mittens from Ynonne Koné. I've made some pretty fab buys this year, and I can only submit: Spurge on what you use every day! These items I've enjoyed this year....and I know I'm going to continue to love them in the years to come. I knew as soon as I put them on they were just "me", know what I mean? And I've noticed when I'm wearing things that are really "me" I tend to get so many compliments and asks of "where did you get that???" "the real 'investment purchases' are the things that you use everyday" true dat. Rick Owens coat and acer tablet have proven very useful. The blue Steven Alan malou top is on it's way and I'm hoping that'll get lots of use. I only wish Everlane is available here in the UK. I nearly caved in and buy their Scottish cashmere shawl but it'll be silly to pay VAT as well as customs duty when it's shipped right back here. Great list. I'm glad those Karen Walker sunglasses are working out for you! I still really want that Acne scarf, but I feel like I just have too many scarves. My best buys have been the building block "dice bag," PS1, and the Madewell "Charley" boots (like a lower-heeled version of the RC Mars boots, another closet mainstay). Hooray for successful and thoughtful purchases! Your collection is pretty awesome, and I think it's fair to say I'm now obsessed with that Canada scarf. Is it as huge and luxurious as it looks? I may have to treat myself to one for the holidays... My favorite purchases this year have been a few sweaters from Cos and some truly indulgent feeling fun patterned wool socks from Falke. Funny how sometimes it's the small things that make you feel the most pampered. It's going on my wishlist, as soon as I decide what color I like best! Of course grey seems the best of the bunch, but all my best scarves are grey so I think I should branch out. Seems impossible to decide though! My best buys were all from reading your recommendations: the Rag and Bone black skinnies ( why did I wait so long to buy black jeans? ), the Annabel Ingall Trio (I am using it inside my work tote too when not wearing it alone), and I splurged on the Church loafers (unbelievably beautiful and surprisingly comfy). Thanks so much for doing all of the hard work of finding the perfect things! I can understand how a lambskin Chanel bag would seem impractical - I have a pair of lambskin gloves and I can't imagine how much I would have to baby a whole bag. It just seems so fragile to me! My best buys have to be my Dieppa Restrepo Calis, which have become the only shoes I wear to work. The second pair is totally justified! I love nearly everything I've bought this year but these shoes are the only ones that make me feel grateful I have them in my life. I'm also really happy with the Steven Alan Lilly after my trip to Taiwan - so so handy for travelling and really quite roomy for something so tiny. You're absolutely right about everyday things -- they add more pleasure to your daily life and they actually make things easier! Love this post so very much, I've been on the prowl for a perfect plain charcoal gray scarf that's wide enough to cover the lower half of my face, and after much research-- looks like I'll be going for the Acne scarf after all! Thank you for that recommendation. My best buys: Bloch leather flats, Rachel Comey boots, Coach Legacy Rambler + Vintage Coach Court Purse, Uniqlo wool cardigan (quality is incredible compared to all other wool cardigans I've owned), also my most recent purchase: J.Crew stadium cloth cocoon coat. Thank you for doing all the groundwork in finding quality timeless pieces, I'm slowly learning to edit and revamp my closet into one that has favourites that I re-wear time and time again as opposed to buying into trends (albeit, tough to resist at times). Great post! I am slowly trying to revamp my wardrobe and it is taking forever, but several of my current favorites are pieces I've read about on this blog, including striped shirts (St. James and a very sturdy one from American Apparel), chambray shirts, grey v-neck sweater, everlane t-shirts, olive utility jacket from j crew and a barbour utility jacket. I have been dying for some of everlane's new cashmere, but they sell out literally within days and so far I've missed the boat -- they have a great new v-neck and also a tunic that looks good, so hopefully I'll get one when/if they restock. If anyone has tried the tunic would love a review. So some everlane cashmere is next on my list, as is a pair of classic black moto boots. Thanks for the inspiration! Lovely post. I totally agree with you about being grateful for the amazing women I've met through blogging. Such diverse, inspiring, women indeed. I love the idea of adding pleasure and a bit of luxury to the other day.